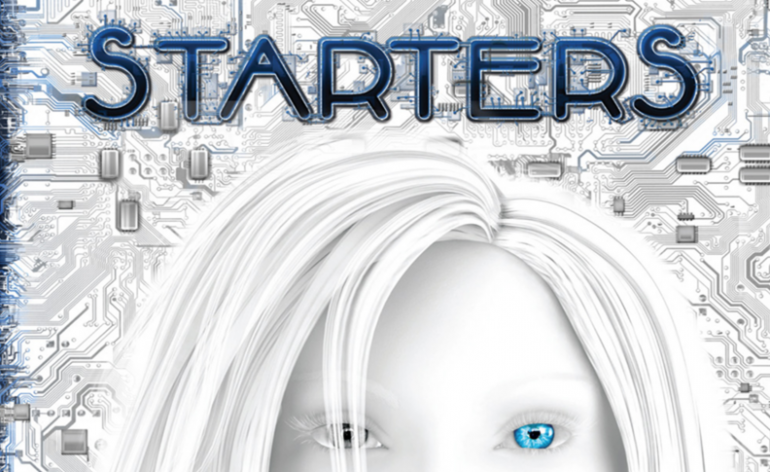 Starters may be considered an interesting book in terms of dystopia, but it is not one of the best and most original of the genre. But even so, I liked the book. I confess that halfway through the plot I was beginning to become discouraged, because I thought that all my expectations would not be satisfied. Unfortunately, it really was not at the beginning but Price surprised me. The plot really improves and finally takes on a form and a course. The secret behind Callie’s awakening in her body, being that she should be “asleep” while an Ender named Helen rented her body starts to take shape. As if that was not enough, a strange voice appears in her head, making the girl start to realize that nothing Prime Destinations does is as harmless as it appears to be. What caught my attention for the plot, was that everything that happened is due to the Spore Wars and Prime Destinations. The story involves politicians, blackmail, guinea pigs, great mysteries about the disappearance of certain people, young people fighting for their own survival and … the Old. I will now take the opportunity to talk about the characters. The Old Man is one of the great mysteries in the book. Who is he and what does he want? Why is he behind an organization like Prime Destinations, using bodies of innocent young people to make money … or maybe more than that? The impression I had is that there is a much larger motive behind it, but it is not clear or revealed. Something that does not only involve money and power, but something more. The Old Man does not get a face until end of the book, but the terror he causes is enough for the whole reading. It destroys lives, hearts, hopes … and destroys dreams. He does not measure efforts to meet ends. I enjoyed the character as a villain. Callie was a good character and fulfills her role. Although, I was a little disappointed when the girl woke up in her body again, after Helen signed her rent, and woke up in a mansion, full of money and resources … for a moment forgetting her goals. That made me a little upset. After all, it did not seem like she had lived so long on the streets, sleeping on a hard floor and living on leftovers. Nor did she think of her brother Tyler, or of her friend Michael, and how they were surviving without her. Although, she had lapses. It is understood that she felt dazzled during some moments with all the opulence around her, but in some moments she failed as a hero. One of these moments is when she doubts the voice in her mind, which turns out to be Helena. She doubts the Ender’s theories about Prime Destinations, though it’s all right under her nose, and everything turns out to be a major tragedy … which can be resolved, of course. The problem is that there is always a loophole for evil to last, right?! Well, apart from these factors, I liked the character. She is strong and determined, and when she realizes what is really going on around her, her courage takes on great proportions. Tyler and Michael are her post-war family. They do not show up much in the course of the plot but it has some importance to the story. Tyler is fragile and suffers from severe lung disease, but his sweetness and way of looking at life are lovely, as is his courage for a boy who is only 7 years old. Michael, is Callie’s unresolved love affair. There is also Blake, a rich young man of 16, the son of a prominent senator who is running for the election (and also has his share of importance in the plot). It will ensure romance for Callie, a relief amid so much pain, and many surprises. Helen, the inquiline of Callie’s body is a character of paramount importance for the plot. It is she who makes her see what is behind various events and makes her see that she has to fight, much more than she has fought, not only for her life, but for the lives of so many others. There are also many other memorable characters, but there are so many that it is difficult to mention them all here. In the book created by Price, one thing that bothered me a lot was the Spore War. Not because of the war itself, or because it happened or not, but because the author gave no explanation about the blessed war. The book ends and there is almost no information about the causes, only the effects. That is, it is known that people between 20 and 60 years of age died, leaving orphans behind, and elderly in the control of the government and world system. This is why they were given priority to get vaccinated against the spores, the elderly, children and adolescents, who would be more fragile in relation to the disease. In addition, we can see the effect that war and disease caused on the planet. Speaking of the author’s narrative, I did like it. I enjoyed the book in a general way. This feeling that young people have no way out … this is oppressive. It’s really scary. And the author is able to pass all these emotions onto paper. The end of the book surprised me, and I have to give Price a hand-clap. When you read the book, you'll be amazed too! She can make our jaw drop. I was very surprised to see that the author is really clever. Many things that we already had for granted, fall to the ground and ... bam - make our heart stop. And mine totally stopped, point in favor for the author! I think there are many cool points in the book, as well as some bad points. And overall, it's a medium to good book, depending on your point of view. I think as dystopia it could be a little better, but the end pays off a lot, and you really will not be disappointed ... with certain aspects.